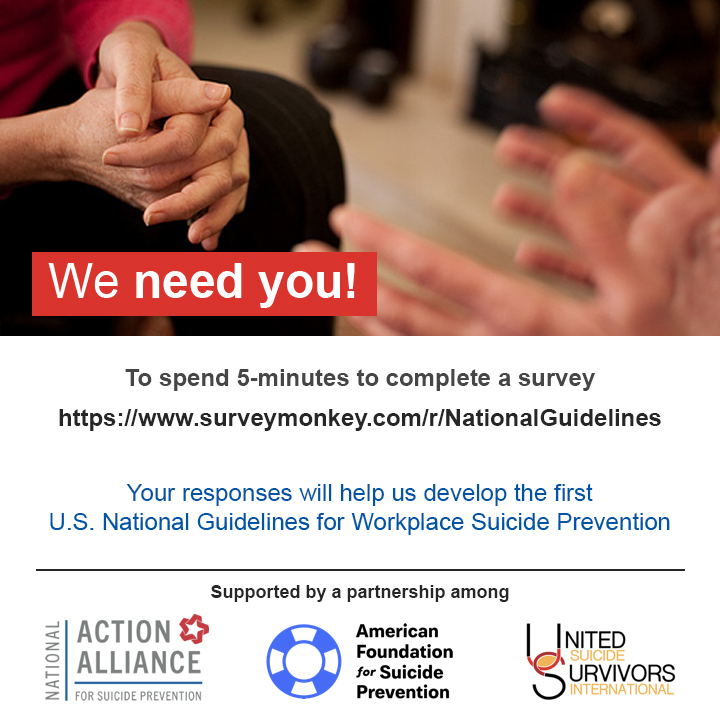 Washington, D.C. (July 23, 2018) – Today the National Action Alliance for Suicide Prevention, the American Foundation for Suicide Prevention and United Suicide Survivors International announces the launch of a survey designed to assist with the development of the first set of guidelines for workplace suicide prevention in the U.S. The purpose of the 5-minute survey is to give stakeholders an opportunity to provide their opinions for the guidelines — content, format, dissemination, implementation and evaluation. The American Foundation for Suicide Prevention (AFSP) is a nonprofit organization that gives those affected by suicide a nationwide community empowered by research, education and advocacy to take action against this leading cause of death. To learn more about AFSP, visit https://afsp.org/. The National Action Alliance for Suicide Prevention is the public-private partnership advancing the National Strategy for Suicide Prevention. To learn more about the National Action Alliance for Suicide Prevention, visit http://actionallianceforsuicideprevention.org/. United Suicide Survivors International is a nonprofit (501c3) organization with a mission to leverage the expertise of people with lived experience with suicide in cultural and systems change. To learn more about United Suicide Survivors International, visit https:// unitesurvivors.org/.